Back in August, my hometown of Geneva, NY ( about 30 minutes from Pioneer Millworks shop )was over-run by camera crews, celebrities, contractors, and spectators as ABC’s “Extreme Makeover Home Edition” came to town to surprise the Hill Family with a new home. There had been rumors abound for several weeks that the show was coming to Geneva, but there was no sign of activity until the weekend before as a demolition crew quietly rolled into town and set up camp up the street, and the front yard of a suspect house was flagged with utility markers. Sure enough, the next morning “the bus” pulled up, and the family was informed that they’d return to town a week later to find a new home where their old one stood. As an added bonus, the community boxing program the homeowner had helped start would be getting a brand new gymnasium behind the house, where a dilapidated barn stood for years. This set was the opposite of the kitchen I worked on in Philadelphia. If you have never seen “Extreme Home Makeover”, there appears to be hundreds of people working round the clock on all facets of construction, building a house from the ground up in a week. The truth is, there ARE hundreds of people, they DO work round the clock, and they complete the house in about 4 1/2 DAYS! Since the house was less than 2 blocks from my home, we naturally took an interest in the project. Its hard not to when the streets are clogged with spectators all through daylight hours! I volunteered on the Friday afternoon of the build to help with carpentry. Upon arrival on the site, I went to work with a crew working on the front porch of the house. Over the next 8 hours, I worked with folks from all over upstate New York, from quite diverse backgrounds, to build the porch and install the drainage system. Just about sunset, word came to us that the final piece of the roof framing had to be set right away so the crane could be moved off the site. As the crane lifted everything into place, the cameras started coming from everywhere as this was a crowning moment in the construction process. It was quite an experience working in that hectic of an environment with a crew of 20 guys I had never met before. But the sense of camaraderie and purpose kept everyone going, and kept spirits high no matter what happened. With my blue shirt dirtied up from the day’s work, I headed home about 9pm to finally get some dinner and rest. Though Pioneer Millworks doesn’t have any wood in this house, it has the energy running through it of the hundreds of volunteers that were a part of bringing the house to completion in such a short amount of time. Bus drivers, cleaners, caterers, local police, and so many more all played a part in getting things done and ready for the big reveal the following Monday. I had a blast being a part of it, and I suggest anyone that has the opportunity to work on one of these houses go for it – you won’t regret it. 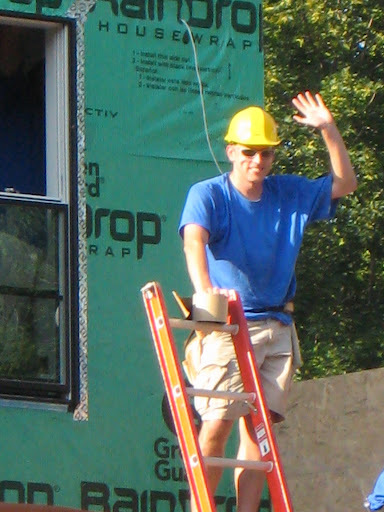 The episode aired last night ( Sunday 11/2/08 ), and you probably saw me – I was the guy in the blue shirt & hardhat. The reality is that very little of the construction was shown on television – much of the time is devoted to the story of the family, and giving product placement to those companies that donated to the show in a big way. Pioneer Millworks was not a part of this episode, as many of the design decisions are made weeks and months in advance to keep on-site decisions to a minimum, and progress to the max. One thing that was pointed out on the show was the use of color in the kids’ rooms. Too often, reclaimed wood is viewed as rustic and rugged. But the truth is, a splash of color on our wood can make a very cool accent, or a theme for a room. Orange, Red, Blue, Green – they’re all available in low VOC and eco-friendly oil & wax finishes. Our favorite wood for this is our Southern Yellow Pine but any of them can work great. Give us a call – ask for some samples – we’ll steer you in the right direction, no matter how “Extreme” you want to go. Thanks for reading – talk to you soon.